Dean Hoangvan, a student at DMACC, practices break-dance moves with members of different crews at the Memorial Union. Currently, there isn't a break-dance club at Iowa State, but Hoangvan said he hopes to be able to form one when he comes back to Iowa State next semester. “I can express a thousand things without saying a word, just by dancing,” said break-dancer Dean Hoangvan about how important dancing is to him. A former ISU student who will be coming back next fall, Hoangvan, has a big dream — to start a break-dancing show in Iowa State. “I watched Cirque Du Soleil. I watched a few of their shows, and I was just kind of inspired by their shows, how they tell stories through talents,” Hoangvan said. Hoangvan has started to put his ideas down in sketches. Ideas flow to him from things that happen in his daily life, the experiences that one has from growing up. Hoangvan has yet to start any productions on his show. The show will incorporate different types of performances including acting, dancing and various dance style, to make the story-telling more interesting, therefore he is still in search of people who are interested, he said. For some, words or drawings can help them tell their stories. 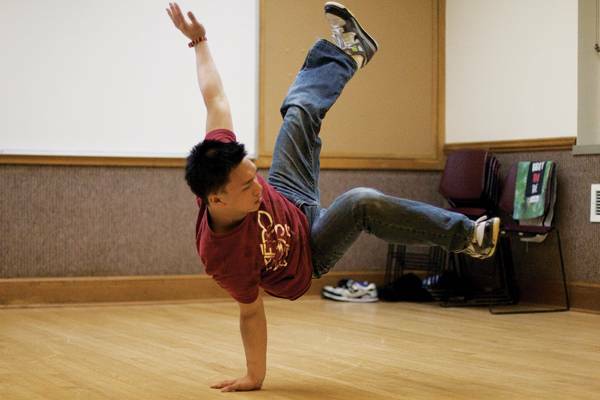 But for Hoangvan, it is his passion for break-dancing that tells his story. He started dancing when he was 14 years old. He saw a kid break-dancing during recess and just wanted to try it, he said. “It became a hobby, then it became a passion, and I’m just stuck with it since,” he explained. He started out with his first performance for a pep rally in his high school, and soon after that, the team he was in — East High School Fusion — began performing across Iowa. From performances, it led to competitions. He has also joined competitions across the nation, and one of the competitions he recently joined that’s closer to home is Wild Style which took place in Columbus Junction. When it comes to practice, Hoangvan meets up with members of different crews around Iowa State to practice together. “Friends get together, and we show each other what we got and what moves we are working on,” he said. Even with school and work going on, he can still find time to practice break-dancing. On average, he practices eight to 10 hours a week. Other than just practicing, Hoangvan also devotes some of his time to teaching others who are interested in learning how to break-dance. For those who are interested, Dub H is performing April 24 and Hoangvan and his friends will be performing in the show.